Microwave sweet corn for 2 minutes and then allow to cool for a while. Then grind along with chilli n cilantro using 1tbsp water to a coarse paste n keep ready. Heat oil in a tempering pan, add mustard seeds wait till pop and add urad dal fry golden brown,then add hing,curry leaves,chilli,onion n ginger and saute for 1 minute and turn off the stove. Now take wheat flour in a wide bowl, add salt, cumin seeds and turmeric,mix well. After that add tempered ingredients and combine well and now add the ground corn paste and knead it to a very smooth dough using very little water. (the dough should be little thick then the chapathi dough). Let the dough rest for 20-30 minutes. Then again sprinkle 1-2 tsp of wheat flour and keand the dough again for a minute and divide it to 8 equal parts. Take one part,roll and on a greased plastic sheet/ziploc pat the dough to a little thick adai. Then flip the adai dough on the heated tawa and toast on both sides till golden brown spot appears. That's it...Tasty Whole Wheat Cron Adai ready. Serve hot along with pickle or Raitha. This is very easy,simple and my fav one. I like to have this Carrot Raitha mainly for Parathas n Palak Rice. Take a bowl,add curd n salt beat until smooth n cream. Add shredded carrot,chopped tomato n cilantro,cumin seeds mix well. Heat oil in a tempering pan, add mustard seeds n dals n chilli fry well and add it to the prepared raitha. Mix well...That's it...Carrot Raitha ready to serve. Happy to send this recipe to "HITS~ Fiber Rich Foods" Happening Here, "I am the Star" @ Vegetarian Food & Me and to the event Gayathri's "Walk Through the Memory Lane" @ Roshan's Cucina and also to Julie's EP Series - Herbs N Spices. The whole wheat corn adai looks absolutely delicious and wholesome. Adai looks fantastic and the carrot raita is mouth-watering. Thanx a lot for linking it to my event ..looking forward for more yummy entries.. The adai looks very nice. Loved the click of the carrot raita. thats an awesome idea for a roti! Healthy adai. 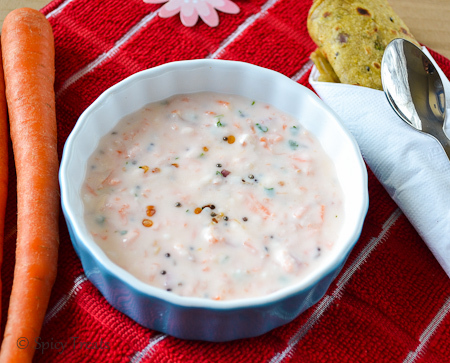 I make carrot raita too .. colorful. Corn adai looks so yum. Good luck with your blog marathon! BTW, I'm curious to know what lens do you use for your pictures? Thanks Rathai...I use Nikon 18-55mm f/3.5-5.6G ED AF-S DX Nikkor Zoom Lens ! Mouthwatering adai and raita. Inviting pictures. Awesome clicks. very healthy , delicious corn masala paratha (adai).nice combo with carrot and tomato raita..loved it. Delicious Combo!!! when i read Adai, i thought soak n grind type!!! this looks real easy!!! Bookmarking them!! Nice different adai and a delicious raitha.. Very Healthy Adai, Sangee ! Looks very tempting and very yummy clicks too.. Very tempting pic. of that healthy adai.